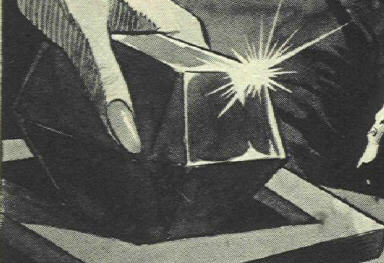 Powers/Abilities/Functions: The Yazdi Gem granted vast power, enabling one to make reality out of thought. It could restructure matter on a scale large enough to allow one to create a grand temple out of the desert's shifting sands, or to destroy that same thing with a mere thought. Among its offensive aspects were the ability to project energy blasts and mystical flames. The Gem even had powers along the lines of resurrection, and it could summon a dead soul and place it into a new, living body. Despite its power, the Gem was apparently quite brittle and easily broken. Even a fragment of the Gem, as held in the Ring, enabled one to harness forces sufficient to generate pestilence, disease, and famine. 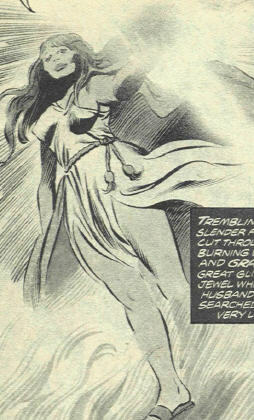 The Ring allowed one to summon dense mists, cause the ground to swallow up someone standing on it, teleport its wearer and others, and to mentally control others--even those with a strong will and their own mental powers, such as Dracula. 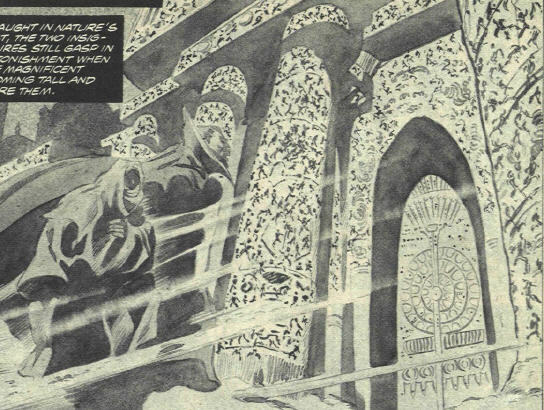 (Tomb of Dracula II#1 (fb)) - The object that would become known as the Yazdi Gem soared through the sky above Earth for an unknown period of time. A red-skinned Aztec waist-deep in a Peruvian swamp saw it, as did three wandering kings, who followed the glittering star toward the birth of a child god. A man named Gholem Yazdi followed the star longer than all of them, and it was he who finally saw it plunge earthward to bury itself in a murky desert oasis. As Yazdi grabbed it, his hands erupted in a horrible, unearthly green-glowing flame. Yazdi accessed the Gem's grand power and created a holy temple around the site where he had found it. Yazdi's fate is unknown, but the jewel vanished for several centuries after his death. (ToD II#1 (fb)) - The Yazdi Gem showed up again in the Middle Ages, when a German nobleman found it and cut from it a single facet, from which he fashioned a ring. The nobleman used the ring to cause the first of the great Black Plagues, some time after which both the ring and the stone faded from history. (ToD II#1 (fb) - BTS) - Dracula learned of and sought the Yazdi Gem and/or its Ring for centuries, to no avail. (ToD II#1 (fb)) - In the modern era, a new-age sorcerer named Augustus Ebers discovered the Ring. It took Ebers two years before he could cast a spell powerful enough to even touch the Ring. Eventually, Ebers managed to locate the Gem itself, and he made plans to retrieve it. 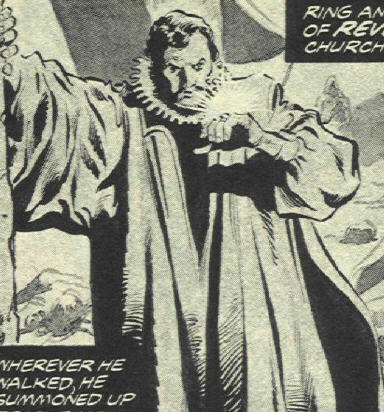 However, Ebers was not sufficiently quick of thought to use the Ring's power against Dracula, who had identified the Ring's power, and had attacked and killed him. Ebers, though his body had died, managed to hold onto the power of the Ring of the Yazdi Gem with his soul, so that Dracula could not remove the ring from his finger. After several futile attempts, Dracula abandoned the effort. Florence Ebers, Augustus' wife, sought to remove the Ring as well, but found herself unable to do so. She began studying Augustus' texts to learn how to take the Ring off and use it herself. (ToD II#1) - After five years of trying, Florence finally succeeded, and placed the Ring on her own finger. She, too, had known where the actual Yazdi Gem was, but apparently required the Ring to be able to handle the Gem. Florence came upon the plan to use the Gem to resurrect Augustus. At the same time, she sought to gain vengeance on Dracula, by transferring Augustus' spirit into him and allowing him to take control. 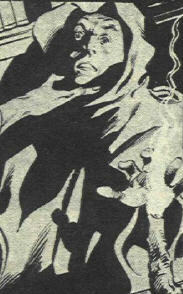 However, Dracula had been destroyed only weeks before by Quincy Harker, within his own Castle (@Tomb of Dracula I#70). Florence Ebers took a "Mystery Cruise" to the ruins of Castle Dracula, where she used the Ring's power to locate Dracula's corpse. She removed the Harker's wheelchair's silver spoke from Dracula's chest, resurrecting him. She then used the Ring to control him and force him to join her on her quest. She brought Dracula to Yazdi's mosque, where he tried to betray her and take the Gem for himself. She immobilized him with the Ring's power, claimed the Gem, and then teleported it, herself, and Dracula back to her mansion. Florence accessed the energies to summon Augustus' spirit, temporarily placing it back into its own decayed form. However, Augustus' lust for the Yazdi Gem maddened him--and perhaps being dead for five years and trapped inside a slowly decaying corpse had something to do with it--and he lashed out. No one, not Dracula or even Florence, would get in the way of him getting the Gem. Augustus accessed the power of the Gem and blasted Dracula into the wall, and the backlash injured Florence as well. Dracula attacked Augustus, but was outmatched, and he tried to renew his strength by feeding on Florence. However, Florence was furious at Augustus for attacking her, and she refused to be used again by either of them. She shattered the Yazdi Gem into pieces, and the pieces were then consumed in a burst of energy. Dracula fled the now burning mansion, but Florence wrapped her arms around her decomposed and stinky husband, told him she loved him, and that now they could be together for all eternity. She held onto to him as they both were consumed by the flames. Comments: Created by Marv Wolfman and Gene Colan. Lifestone Tree has been shown to be responsible for the origins of many of the power gems seen throughout the universe. Whether the Yazdi Gem has any connection to these is extremely unlikely to ever be discussed. The Gem was shattered, but what about the Ring? Yersinia pestis...that's the organism that causes the Bubonic Plague, which I believe is the same as the Black Plague. Actually, that was the name back in 1995, when I was still in school...it may have changed since then. Thor I#293-294, which established the idea that a previous version of the Asgardian pantheon (an idea much refuted since, even though Gaea herself confirmed it in Thor I#301!) presented the idea that the Star of Bethlehem was in fact the brilliant explosion that resulted from the destruction of this earlier Asgard in this earlier Ragnarok. I should note that Marvel Holiday Special#1's Thor story, which had Thor destroy an asteroid controlled by the wizard Grylak (see Santa Claus entry) probably was not intended as an explanation for the Star of Bethlehem. The story itself pretty much implied that Odin arranged the destruction of the asteroid so that it would provide light to guide a sailor named Sigurd home to safety. (Sigurd's wife Sia had earlier prayed to Odin.) So nobody in Palestine probably saw the destruction of the asteroid. --unless of course, you consider...magic!!!! However, a couple of comic books have depicted the nativity. In the 1950's, the title Bible Tales for Young Folk adapted Bible stories, doing the birth of Jesus in its first issue in a story drawn by Joe Sinnott. More recently, the Life of Christ series published in the early 1990's in conjunction with Nelson did as its first part another adaptation of the birth of Jesus in The Christmas Story. Gollum, Smeagol, of Middle Earth...My precious! He followed the Gem as it sailed through the sky sometime around the first century AD. 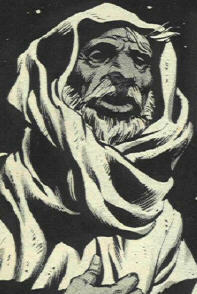 He gained great power from the Gem and built a mosque around the site where he had discovered it. His subsequent fate is unrevealed. He discovered the Gem in the Middle Ages and created the Ring from it. He had been excommunicated from the Church for his Satanic beliefs. He created the first of the great Black Plagues as part of his campaign of revenge against both Church and State. He first learned of the Yazdi Gem as a boy of fourteen when his parents had perished in its search. He sought the stone for forty-two years before obtaining the Ring. It took him two years to amass a spell to enable him to even handle the Ring. At some point after this, shortly after discovering the location of the whole Gem, but before he could retrieve it, he was attacked and slain by Dracula. 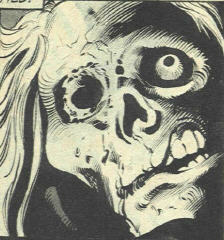 The Ring's energies preserved his spirit in his animate corpse for five years. Eventually Florence took the Ring, brought the Gem to him, and tried to transfer his spirit into Dracula. Augustus's mad lust for the Gem caused him to nearly kill Florence as he attacked Dracula. He had nearly overpowered Dracula when Florence destroyed the Gem, to end his madness. She then allowed a fire to consume them both, so they could be together forever. (ToD II#1 (fb)) - After Augustus' death, she sought to remove the Ring, but found herself unable to do so. She began studying Augustus' texts to learn how to take the Ring off and use it herself. Florence Ebers took a "Mystery Cruise" to the ruins of Castle Dracula, where she used the Ring's power to locate Dracula's corpse. She removed the Harker's wheelchair's silver spoke from Dracula's chest, resurrecting him. She then used the Ring to control him and force him to join her on her quest. She brought Dracula to Yazdi's mosque, where he tried to betray her and take the Gem for himself. She immobilized him with the Ring's power, claimed the Gem, and then teleported it, herself, and Dracula back to her mansion. Florence accessed the energies to summon Augustus' spirit, temporarily placing it back into its own decayed form. However, Augustus' lust for the Yazdi Gem maddened him--and perhaps being dead for five years and trapped inside a slowly decaying corpse had something to do with it--and he lashed out. No one, not Dracula or even Florence, would get in the way of him getting the Gem. Augustus accessed the power of the Gem and blasted Dracula into the wall, and the backlash injured Florence as well. Dracula attacked Augustus, but was outmatched, and he tried to renew his strength by feeding on Florence. However, Florence was furious at Augustus for attacking her, and she refused to be used again by either of them. She shattered the Yazdi Gem into pieces, and the pieces were then consumed in a burst of energy. Dracula fled the now burning mansion, but Florence wrapped her arms around her decomposed and stinky husband, told him she loved him, and that now they could be together for all eternity. She held onto to him as they both were consumed by the flames.